Laying laminate flooring over top of a concrete floor will give the concrete a bit of color and decoration that a hard gray concrete floor cannot compare to. There is nothing difficult about doing this, and anyone with do it yourself experience will be able to accomplish this task. The labor involved will be the hardest part, but once the flooring has been laid, the results will give a bit of elegance to any concrete floor. Clear the floor then vacuum it well. Remove tack strips or any other old materials that might be left over from removing the old floor. Remove your base trim or molding. Check to make sure you have enough materials, most all flooring is purchased by the square foot. To find out your square footage, measure the length and width of your room, then multiply them together. Example: a room that is 10-feet by 15-feet would be 10 x 15=150 square feet. Roll out the underlayment pad over the concrete. Connect all the pieces together with duct tape. Cut it to fit with a utility knife. 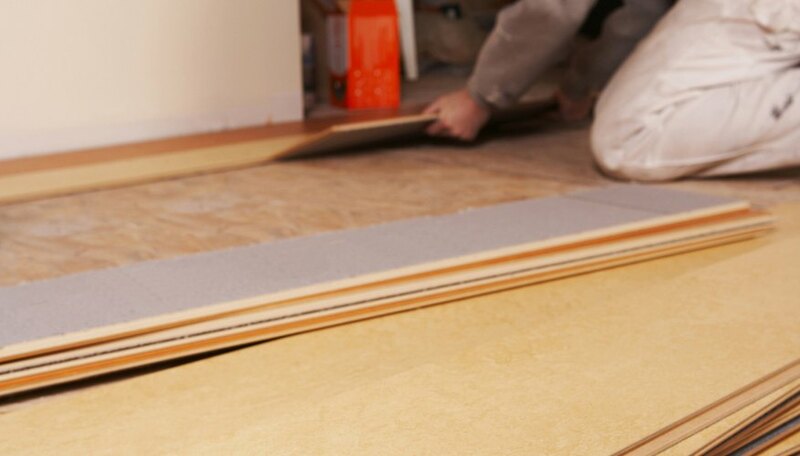 Lay the laminate, the first roll of floor boards go against your starting wall, groove side towards the wall. If you do need to cut the first row of boards to width, be sure that you cut off the groove side and place the cut side on the wall. Use spacers if needed to ensure you leave a 1/4-inch gap between the wall and the flooring. The 1/4-inch gap needs to be between the flooring and the wall all around the room. As you lay the flooring down you will need to use a mallet and pull bar to snug things up as you go. Just a few gentle taps are all that is needed. Once the flooring is in place, install or reinstall your baseboards and moldings, making sure you nail them to the wall into a wall stud. Use a hammer and finishing nails, or a brad nailer. This will cover the 1/4-inch gap that was left around the perimeter of the room. Keep in mind that most laminate floors are floating floors. If you find you have cut some boards too short and the baseboard will not cover over it, don't worry, just install quarter-round trim at the floor line to the baseboard. Plan for success, because no plan is a sure plan to fail. If your using a power saw cut the boards upside down.